Vivien Goldman knows people. 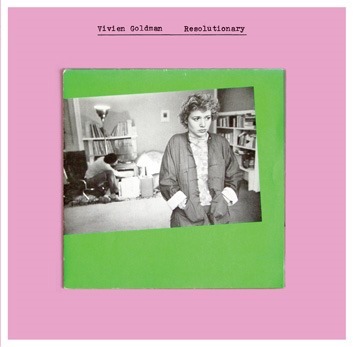 She’s written about so many in her capacity as a widely-published journalist, and she’s worked with a fair few, too, and as such, Resolutionary is a fascinating document of her collaborations, recorded during a particularly fertile period between 1979 and 1982. The roll-call of musicians featured on the eight tracks here is staggering: John Lydon, Keith Levene and Bruce Smith (PiL) Robert Wyatt, Steve Beresford and David Toop, and Vicky Aspinall (The Raincoats), and Neneh Cherry, amongst others, all feature here. In many ways, Resolutionary is an odds-and-sods effort, a curio, a retrospective exhibition which focuses on the individual artist’s career more than its context, and which represents what was essentially a brief period in Goldman’s career, which has since been devoted to the documentation of music-making, rather than the actual making of music. But Goldman’s musical legacy is noteworthy, however scant. Her brief time with The Flying Lizards remains a career-defining spell, despite the fact that she wasn’t the one who provided the vocals on their biggest hit, ‘Money’. But in many ways, that’s a positive. No-one wants to be pegged as a one-hit wonder, their life spent in the shadow of that singular moment, and more importantly, Resolutionary serves to realign history, to an extent. It’s an interesting aside to note that Public Image’s ‘This is Not a Love Song’ was inspired, in title at least, by The Flying Lizards track ‘Her Story’, which features here. Indeed, the two Flying Lizards tracks, ‘Her Story’ and ‘The Window’ (both of which feature Goldman on vocals, the latter of which was also composed by her) represent the detached, minimal pop they’re famed for. Big, strolling basslines are again the defining feature of these off-kilter noodles. Although readily available on The Flying Lizards’ eponymous debut, revisiting them in the context of Goldman’s output rather than that of the band offers an alternative context. The dubtastic quirky kitchen-sink pop of solo cuts ‘Launderette’ and its attendant B-sides, released on the ‘Dirty Washing’ 12”, are worth the money alone. ‘Private Army’ is a colossal six-and-a-half spaced-out dub-based beast, the percussion and sax spiralling into a vortex of reverb. ‘P.A’ Dub’ – the dub version of ‘Private Army’ does dub out the vocals. The Chantage tracks are the most accessible, with a lighter tone and style, with the pop reggae of ‘Same Thing twice’ proving a buoyant standout. But then, the Gallic theatricality of ‘It’s Only Money’ is equally beguiling and showcases Goldman’s range. The interview with Vivien, recorded in 1981 and released on a cassette compilation is interesting, articulate, energetic, and insightful, although the audio quality is less than brilliant, and one does have to strain at times to decipher what’s being said. Still, as a historical document, its appearance on the disc is more than justified. The extensive liner notes, too, are pretty good, and overall, this is a quality package.